Videos, worksheets, stories and songs to help Grade 7 students learn about operations on numbers in Scientific Notation. In this lesson, we will learn how to add and subtract numbers, written in scientific notation, without using a calculator. The following example shows how to add numbers in scientific notation. Scroll down the page for more examples and solutions. 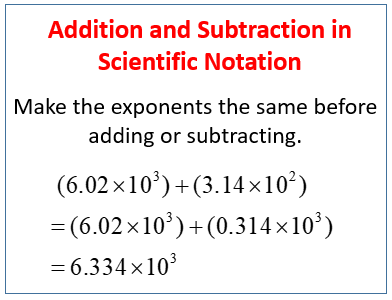 Explains how to add and subtract numbers written in scientific notation, whether or not they have the same exponent. When adding and subtracting numbers in scientific notation, you have to make sure the exponents are the same. Why? This video explains. Adding /subtracting numbers written with scientific notation.